Size: 4.6" x 2.6" x 0.4"
This Canon LC-33 looks different to its predecessor LC-31 and makes use of a novel manufacturing technology. Instead of using a traditional printed circuit board (PCB) the LC-33 uses a flexible foil pressed against a heavy metal sheet. Not only the LC-display but even the calculator circuit missed any solder joint. We noticed this construction already with the LX-30 and LX-40, too. 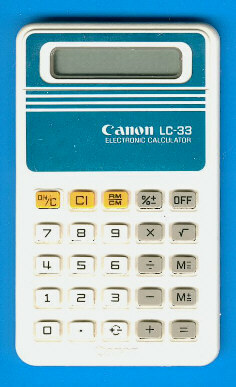 Main differences between this LC-33 and the two LX sibblings are the 3-key versus 4-key memory and the [+/-] function. About two years later we Canon introduced with the LC-34 a traditional design again. Don't miss the colorful LC-33 versions featuring the PEANUTS Characters, we know them with a white, yellow and pink housing or the PADDINGTON BEAR in a white housing. © Joerg Woerner, October 11, 2001. No reprints without written permission.